The ultimate Thanksgiving side dish, maple sage roasted brussels sprouts pair the popular fall herb sage with sweet and buttery maple syrup. There was a time in my life where roasted brussels sprouts would have sent me running from the kitchen. There was also a time where I dreamed of being an Olympic figure skater. And a time where I thought I would never own a puppy. Ah, time. It’s funny the way things go and the way life works out because now all I want to eat are these maple sage roasted brussels sprouts, my dreams no longer involve countless hours spent in an arena and I own the most adorable puppy in the world. When I think about these three things, I am quite pleased about the direction things have taken. I’m not really sure what my dreams consist of these days, but that’s another story because when I say I don’t know, I mean I really don’t know. I just have to remind myself that time has a way of working things out. I’m finding that I’m constantly giving myself little reminders about this throughout the day when I start to have that feeling of stress and anxiety creep over me. As much as I try to remind myself of these big things, I tend to forget the smaller things. I completely failed yesterday because I forgot my purse in a lecture hall. Woops. 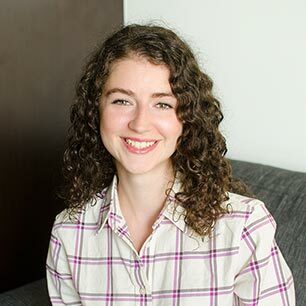 But, like I said, time has a way of working things out because two hours later, my ruby red purse was still hanging over the back of the chair in the fourth row. That chair where I sat contemplating and asking myself questions: what do I want? November is turning out to be quite a think-y month for me. Many of you probably have Thanksgiving on your mind right now, so you might be preoccupied with Thanksgiving recipes and dishes instead of these existential crisis-esque thoughts I have on mine. If you’re looking for a simple side dish, these brussels sprouts will hit the spot. They are flavoured with one of my go-to fall herbs; sage. It’s a highly aromatic herb with earthy notes that is commonly used in Thanksgiving stuffing, but I love using sage with vegetables (especially winter, root vegetables). I’ve been having a bit of a love affair with sage recently because I’ve had Thanksgiving recipes on my mind, so I combined sweet and savoury into this side dish resulting in these melt-in-your-mouth maple sage roasted brussels sprouts. …we are all works in progress. …just do the next right thing. …to look up from the screen. …take in the moments. They are everything. …you don’t have to have it all figured out. …you can’t have it all figured out. The ultimate Thanksgiving side dish, roasted brussels sprouts pair the popular fall herb fresh sage with sweet and buttery maple syrup. 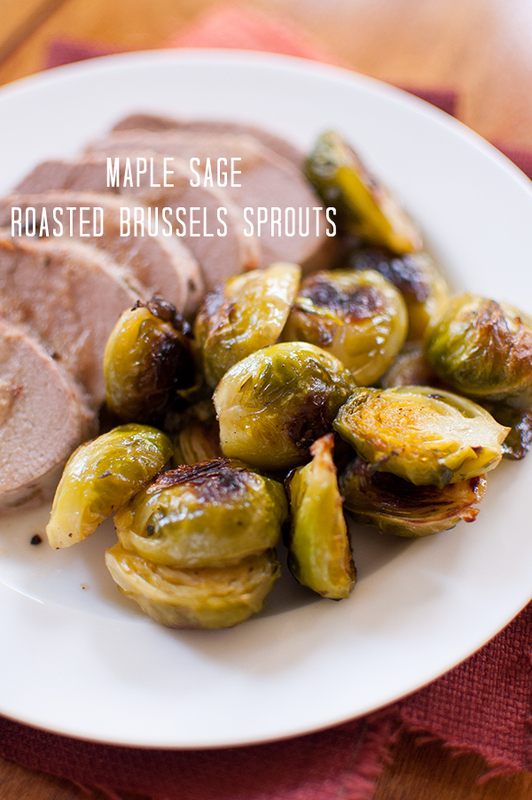 Combine maple and sage with brussels sprouts for the perfect, simple Thanksgiving side dish. Toss brussels sprouts with olive oil, sage and salt. Roast in a roasting dish for 12 minutes. Drizzle and toss with maple syrup. Return to oven and continue roasting for another 2-4 minutes. And now, my lovely friends, all you have to do is remember to make these maple sage roasted brussels sprouts for Thanksgiving. Thanks, Momo! Let me know if you give them a try. YUM!! Can I please have these for dinner tonite?!! I LOVE brussels sprouts!! Every time they have them at the cafeteria I get excited... they're just so tasty and comforting on a chilly day!! I was never a fan of veggies growing up, so I always turned my nose up to Brussels Sprouts, and the like. It wasn't until I was an adult that I started eating them, and now we roast them up regularly. I love mine with lots of bacon! And I, too, had dreams of being a pro figure skater. It was a short lived dream, but a dream none the less. 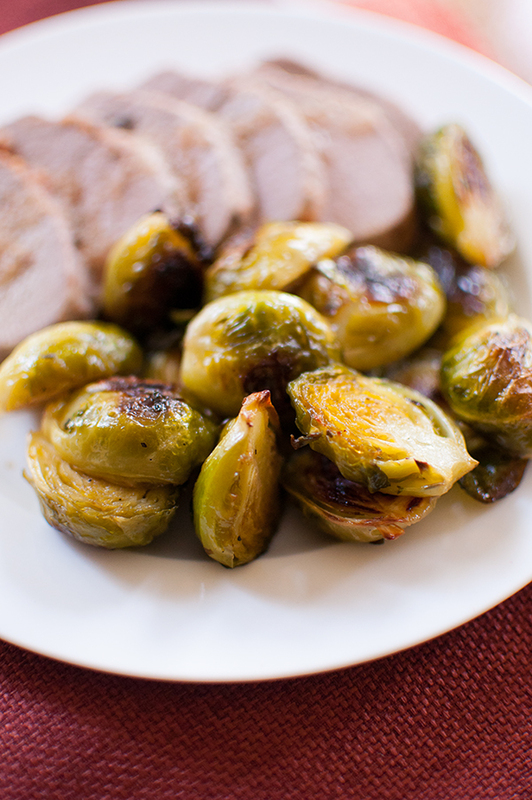 We love brussels sprouts and the maple flavor would really go well with turkey!